Disclaimer: The Empire Ears Phantom was sent to us in exchange for our honest opinion in this review. Many thanks to Empire Ears for giving us this opportunity. 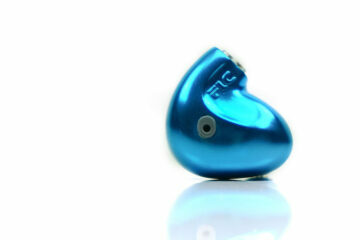 You can read about previous Empire Ears products reviewed on Headfonics here. Empire Ears has been covered a few times on Headfonics over the last few years, most recently the Nemesis by Mike. The Phantom, however, is my first formal review of their gear. It is not the first time I have heard their range being a frequent visitor to their booth at CanJam in Singapore. In fact, at the 2018 show, I was asked by Jack and his team to give a studied opinion on both the Phantom and Legend X which were both hooked to the Effect Audio Janus Dynamic. On the day, I found the Phantom to be the clear winner on personal preference and the Legend X to be a little too bassy for my tastes. With notes in hand, we shook hands there and then on getting the Phantom reviewed this year. At $1799 this is not cheap by any standard. Compared to some of the competition out there the Phantom could well be considered a very good value CIEM and perhaps one of the most endearing sounding custom monitors at this price point. The product line-up has gone through a number of changes over the last few years. However, in late 2018 we have two distinct EE categories – The X and EP series. The X Series is pitched as the company’s take on the “live sound” and generally perceived as a somewhat more musical sound. The EP series is positioned as the more accurate sounding category, more born from the needs of studio pros to put out a certain type of sound they feel best represents the music they are producing. The Phantom is the flagship of the EP series with the entry-level EVR and mid-range ESR variants completing the EP line-up. The Phantom has two unique tech features that are inherent within the entire EP range of monitors; A.R.C. or Resonance Mitigation Technology and synX crossover technology. A.R.C is short for Anti-Resonance Compound and is a special type of damping coating used on the inside of the Phantom’s shell and applied to virtually every component used such as the drivers, tubes, and crossover boards. EE claims that this coating adds a critical level of mass or solidity to the internal components. This, combined with ferrofluid damping inside the driver, creates a very resonate-free and phase-correct listening experience with the Phantom. 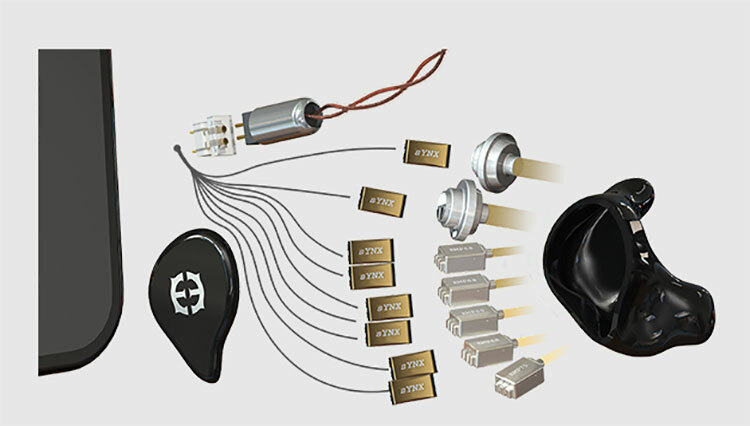 synX is basically an enhanced crossover technology designed to enhance the available audible bandwidth to each individual driver over and above regular crossover designs. In doing so, Empire Ears claim that with the EP range and the Phantom, in particular, are able to eliminate phasing issues and deliver very low levels of distortion that allows their engineers to better fine tune their desired frequency response curves. It is a little moot these days to driver count given the rapid rate of complementary technology such as tubeless drivers. 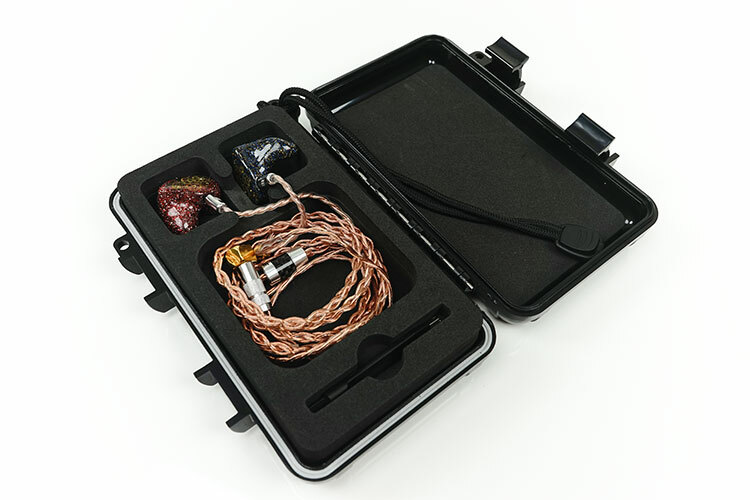 64 Audio Tia and CA TAEC are good examples of using unique designs and to some extent, the Phantom is following suit with ARC and synX. The Phantom has 5 balanced armature drivers with these being a mix of Sonion and Knowles with proprietary tuning. The exact configuration is 2 Low, 1 Mid, 1 High, 1 Super High with a 5-way synX crossover. This puts it on a head to head with the likes of the Vision Ears VE5 which also uses a 5-driver setup. 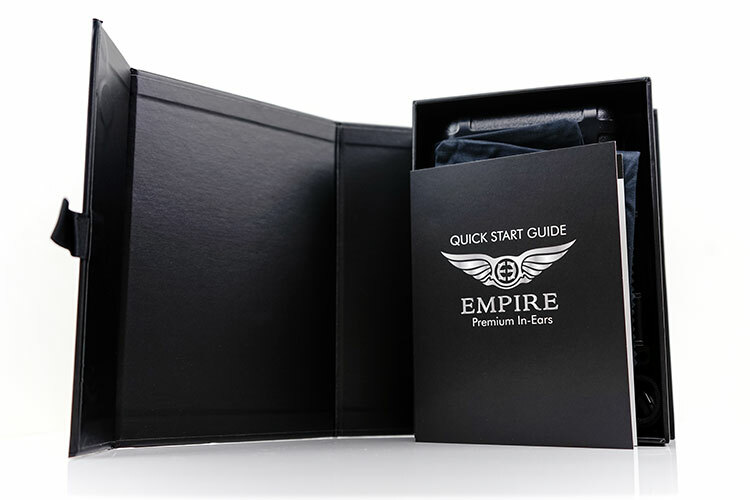 Like many CIEM providers, Empire Ears provide an online design tool for you to create your own custom monitor to buy. I would rate the complexity around the same level as Custom Art and Vision Ears design tools in that it is fairly logical in terms of the step by step design process and you are allowed to pay for it online rather than do everything manually. It will require you to register an account but it is very quick and painless. Having an account is a requirement to buy anything from the online store. You can check-out securely via PayPal or a designated credit card once you complete your billing and address details. Beyond that, I believe you can check your order history and you will get an update when your Phantom is shipped much like 64 Audio’s excellent online store. 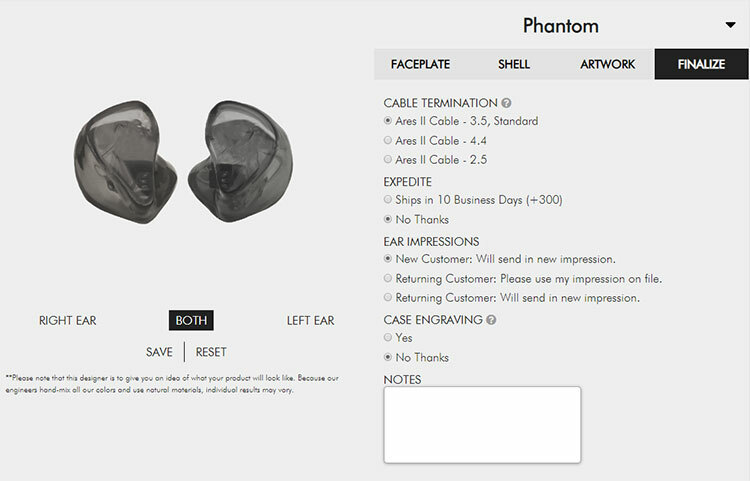 The Empire Ears store has 4 distinct phases; faceplate, shell, artwork, and finalize. Because the shells are handmade rather than 3D printed the choice of designs is incredibly varied. There is something like 62 different faceplate choices alone split into 5 different categories such as standard, premium, and glitter. The base price will begin to vary when you pick anything other than standard. It costs an additional $80 for premium and glitter plates up to $150 for their limited blue burl plates ($75 per side). 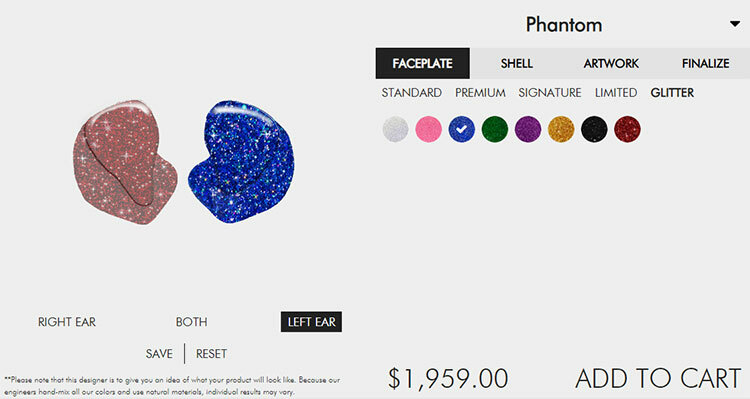 It is a little pricier than the Lime Ears and Custom Art plate options so just watch your indicative check-out price at the bottom of the screen. Shells follow the same path with the standard for free and glitter an additional $40 per side. Logo’s are free and you do have the choice of provided logos or uploading your own individual artwork to use, (custom artwork has a fee). If you want a smattering of Swarovski crystals on top that’s an additional $80 a pop but honestly that bling stuff can stay the hell away from me as far as I am concerned. There are not many optional accessory selections is in the finalize section but it does give you the choice of jack termination type for the excellent 2-pin Ares II 4-wire stock cable. You also can finish your order with shipping turnaround time but be warned, the fast shipping is an additional $300 which personally I think you should avoid. The case engraving is up to you, it will not cost additional so go ahead knock yourself out with a name or branding meme. 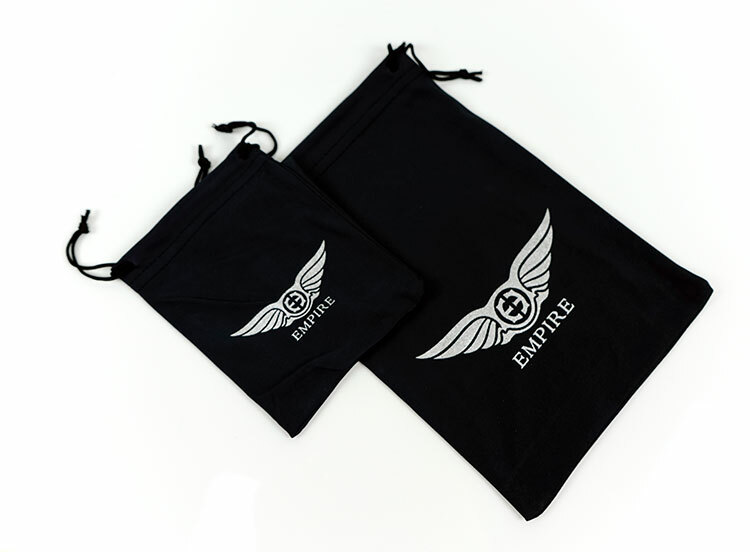 The dust bag is really just a larger version of the IEM pouch and is designed to slide in the Aegis carry case for travel purposes. The Aegis case is very similar to the older 64 Audio cases before they went small and used cheaper plastics. It is more or less on the same lines of a highly customized Otterbox 2000 series container. I actually prefer the weather sealed Aegis case over heavy threaded pill cases and 64 Audio’s new micro-containers. They feel sturdy, are pretty shallow if a bit long and the contoured internal foam display shelf does a nice job of protecting and showing off at the same time. There is not a huge amount of room for anything like an additional cable but it is relaxed enough so swap out for thicker 8-wire variants which is where you want to go with the Phantom if you fancy a cable upgrade. As with all custom monitors you do need to send in ear impressions to Empire Ears and at this point, I generally have a nosy to see how much guidance they give to their customers on how to do this. The good news is the provided guide on their website are excellent with plenty of pictures of a good impression and a bad impression. I would advise printing it off along with the official PDF Guide and taking it with you to your audiologist to ensure it is done correctly. For the record, Empire Ears requires open-mouth full ear impressions to the second bend in your ear canal so you should bring a bite block with you when having the impressions done. This helps keep the open mouth pose steady for accurate impressions to form. Hong Kong, Japan, South Korea, Singapore, & Thailand customers seem to be locked out of the online system. Instead, they have to go through local EE dealers. I do not know if that brings any benefits personally or if the price is higher, perhaps you can chime in on that if you are from those areas. Once sent the current turnaround time is around 5 weeks which is just average. Westone can churn it out in 10 days and Avara Customs in about 1 week. This is not as slow as Noble thankfully but some patience is required.